In April 2010 Alex went to training camp at the Olympic Facility in Colorado Springs, CO. This was in preparation for the USA National Summer Games that were held in Lincoln, NE the summer of 2010. On Friday Alex returned from training camp at Lake Placid, NY in preparation for the World Winter Special Olympic Games which will be held in South Korea in January 2013. 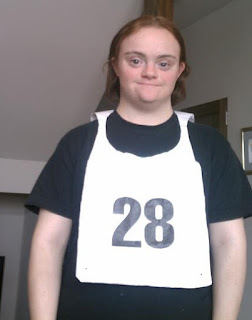 Alex was #28 at training camp and brought home her bib as a "gift"
One of the benefits of keeping this ongoing journal for 3 ½ years is the ability to regurgitate at will. Alex continues to grow, learn and mature every year, sometimes quickly and sometimes not so quickly, but it is a constant in her life. These posts change on a daily basis, but the basic Alexisms, the ones that define her and make her so special do not. I wrote the following post entitled “Recovery” after Alex’s return from Colorado Springs, I could have written it on Saturday after Alex’s return from Lake Placid. I think I would be drained after a weekend like she had! Beth however is so even tempered that she rarely gets overly excited or incredibly sad. I'm glad Alex was able to make it to practice and play in the game! Thanks Cindy - I am glad Beth is even keeled - our kids are so like us aren't they? It will be interesting to see if this is true in your family too! That's some great insight. Perhaps her ability to focus on event at a time is one of the blessings of having down syndrome? I think it is...Alex focuses on one thing at a time and will not start another task until the previous one is finished. She is very particular about that - and although we get frustrated - it works for her and I appreciate it.